A really interesting first person account of Hasidic Williamsburg, seemingly written by Deborah Feldman (nee Berkovic,) author of NYT Bestselling book Unorthodox. It is a description from an insider’s perspective, although the writing is a better reflection of the style of writing among high school students than of a reliable personal opinion. Thank you to the former classmate for sharing! “I know no other place as well as I know Williamsburg. It is the place where I first skinned a knee, established a friendship, and tasted a slice of pizza. 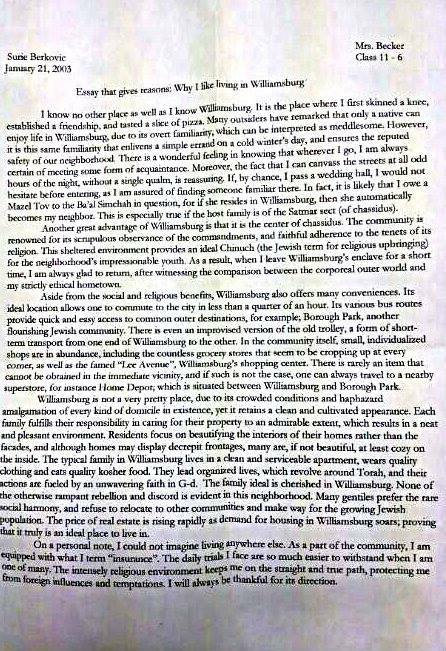 Many outsiders have remarked that only a native can enjoy life in Williamsburg, due to its overt familiarity, which can be interpreted a meddlesome. However, it is this same familiarity that enliven a simple errand on a cold winter’s day, and ensure that reputed safety of our neighborhood. There is a wonderful feeling in knowing that wherever I go, I am always certain of meeting some form of acquaintance. Moreover, the fact that I can canvass the streets at all odd hours of the night, without a single qualm, is reassuring. If, by any chance, I pass a wedding hall, I would not hesitate before entering, as I am assured of finding someone familiar there. In fact, it is likely that I owe a Mazel Tov to the Ba’al Simchah in question, for if she resides in Williamsburg, then she automatically becomes my neighbor. This is especially true if the host family is of the Satmar sect (of chassidus). Another great advantage of Williamsburg is that it is the center of chassidus. The community is renowned for its scrupulous observance of the commandments, and faithful adherence to the tenets of its religion. This sheltered environment provides an ideal Chinuch (the Jewish term for religious upbringing) for the neighborhood’s impressionable youth. As a result, when I leave Williamsburg’s enclave for a short time, I am always glad to return, after witnessing the comparison between the corporeal outer world and my strictly ethical hometown. Aside from the social and religious benefits, Williamsburg also offers many conveniences. Its ideal location allows one to commute to the city in less than a quarter of an hour. Its various bus routes provide quick and easy access to common outer destination, for example; Borough Park, another flourishing Jewish community. There is even an improvised version of the old trolley, a form of shot-term transport from one end of Williamsburg to the other. In the community itself, small, individualized shops are in abundance, including the countless grocery stores that seem to be cropping up at every corner, as well as the famed “Lee Avenue”, Williamsburg’s shopping center. There is rarely an item that cannot be obtained in the immediate vicinity, and if such is not the case, one can always trail to a nearby superstore, for instance Home Depot; which is situated between Williamsburg and Borough Park. Williamsburg is not a very pretty place, due to its crowded conditions and haphazard amalgamation of every kind of domicile existence, yet it remains a clean and cultivated appearance. Each family fulfills their responsibility of caring for their property to an admirable extent, which results in a neat and pleasant environment. Residents focus on beautifying the interiors of their homes rather than the facades, although homes may display decrepit fringes, many are, if not beautiful, at least cozy on the inside. The typical family in Williamsburg lives in a clean and serviceable apartment, wears quality clothing and eats quality kosher food. They lead organized lives, which revolve around Torah, and their actions are fueled by an unwavering faith in G-d. The family ideal is cherished in Williamsburg. None of the otherwise rampant rebellion and discord is evident in this neighborhood. Many gentiles prefer the rare social harmony, and refuse to relocate to other communities and make way for the growing Jewish population. The price of real estate is rising rapidly as demand for housing in Williamsburg soars; proving that it truly is an ideal place to live in.